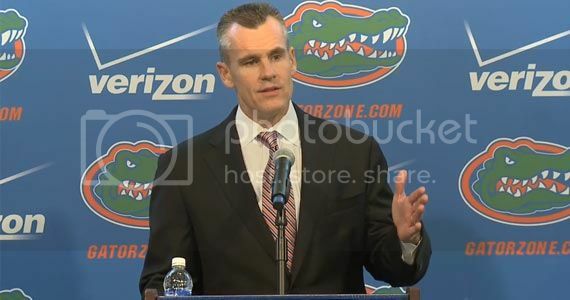 During his team’s media day on Wednesday, Florida Gators head basketball coach Billy Donovan threw his support behind an embattled colleague, head football coach Will Muschamp, noting that the entire athletic program is “all in this together” and hoping for a positive outcome to the football season. “I’ve got an enormous amount of respect for Will,” Donovan began. “Obviously for him, I look at things a little bit differently. Certainly he took over a situation that was really, really challenging, in my opinion. I thought he imposed his style of play on his team. I thought the year before, I saw an unbelievable change inside of his team from a physical standpoint from year one to year two. “The way they had to handle all the injuries last year was something, to me, that was just totally insurmountable to ever overcome. You can’t lose the level of players – and I respected the way Will handled it because he never used that as an excuse – but the truth is you can’t lose that many good players and be good. You just can’t. Donovan respects Muschamp so much, in fact, that he invited him to speak in front of the Florida men’s basketball team this summer. Donovan hoped bringing Muschamp in would help enlighten his players on how quickly things can turn from success to struggle simply from the loss of personnel – whether due to graduation or injuries. “As he said, you just don’t plug guys in and guys just step up. There’s a lot that he was able to provide for our team and help our team grown in his experience as a coach, too,” Donovan said. From purely a coaching perspective, Donovan also appreciates what Muschamp does with the Gators football team and thinks it is headed on the right path this season. “I never look at it as how we’re doing [as the basketball program]. I always look at it as ‘Florida,’ everyone doing well. But just me from a coaching standpoint? Where his team is at emotionally now and where they’re at emotionally now, it’s really impressive,” he said. “I look at things a little bit differently. I know a lot of times people look at just results, but I think if you look at the transformation inside their team, to me, watching them play this year compared to last year, to me, it’s night and day. This relationship should come as no surprise to athletic director Jeremy Foley, who said on the radio two-and-a-half months ago that he believes there are a bunch of similarities between Donovan and Muschamp. “I’m not saying Will and Billy are the same person, but [when I hired Muschamp] I saw the same energy, I saw the same passion, I saw the same enthusiasm, I saw the same track record in terms of he coached for some of the greats, certainly Nick Saban,” said Foley. It’s nice to hear Donoan support Muschamp. But it doesn’t matter if there’s a “night and day” difference between last year’s team and this year’s, if it doesn’t manifest itself in wins or losses. Donovan knows that your record, not anything else is what you’re ultimately judged on. It doesn’t matter what the reasons are, if you don’t win, you’re out, unless you have some savings in the bank. Last year drained the Muschamp account, he has nothing but this season to sink or swim on. It appears he is sinking. There’s still a chance to right the ship, but the outlook isn’t sunny. You are what your record says you are. Florida faces only two more ranked teams. Muschamp’s record against ranked teams is 4-13. Even if UF beats all the other teams and finishes 7-4, his record against ranked teams will fall to 4-15. I don’t think that was what Foley was refering to when he said that Florida needed to be relevant and contend for the East title. 7-4 will keep Muschamp at Florida. Sadly, I think you are right. That record is the average record under Muschamp and is improvement over last year which is probably enough for Foley. If there was a different athletic director, I’d disagree, but I don’t think Foley wants to admit he was wrong when he hired Muschamp, and firing him would confirm that he screwed up. How about 8-4 with a convincing bowl win. Foley may have seen the same person, the same tenacity, the same passion, etc. but there isn’t the same inflexibility. When Donovan saw something wasn’t working or wasn’t working as well as it could, or when he changed up personnel, he altered his style, he altered his game plan, he made halftime adjustments. He doesn’t stubbornly stick with the same thing whether it is working or not. He doesn’t stick with the same person if that person isn’t producing, benching Young, for example when he didn’t believe he was giving 100% effort. Basketball has far more turnover than football, they aren’t required to stay 3 years in hoops, and yet that sounds exactly like the excuse implied or otherwise if it isn’t turnover it is injuries. Coach Donovan knows how to coach .He’s a Great one at coaching up during the game and re-positioning his players for maximum efficiency . As long as Muschamp is here at Florida people will be waiting for BB season to begin .Knowing the best team possible will be on the floor . Not so much with Muschamp .Example . Dubose does a jet sweep and gains 40 yds and we don’t see him again ! At goal line was a another very judgmental piece of Muschamp football . He should stick to Defense , Roper to Offense . Also wouldn’t hurt if ‘Boom’ put in a call to ‘Quinn’ and ask him how he did his fine defense’s at Florida that he now does for Seattle ! Why didn’t Seattle hire Boom if he’s so great ? Cause it was Quinns ‘D’ . Donovan is a class act . Very mature man an coach . There is no way he would ‘Bash’ Muschamp a fellow coach & friend !! Sorry but the statement of “Why didn’t Seattle hire Boom if he’s so great ?” is not real smart. Hmmmm .. let me voluntarily take a demotion (in title and pay) from the Head Coach at one of the top 5 jobs in college football to be a defensive coordinator in the NFL ?? Really ? it would get Muschamp in the pro’s . Once there it seems most stay as long as they want . No matter how bad they just go to another club . Quinn is doing great at Seattle with his ‘D’ and Willis not so much ! I just want the stubborn coach of the century gone ! !